Beware, chile novices—you may be too green for this green chili. It is a favorite of the Navajos and they like it hot. Go light on the chiles when starting out—you can always add more. Serve this with Bear Paw Bread (Pueblo Indian French style bread) or generously buttered hot flour tortillas. Melt the pork fat in a heavy straight-sided 5-quart pot over medium high heat. Combine the flour and salt in a paper bag. Add the pork cubes and shake bag to coat them with flour. Shake the excess flour off the pork cubes. Add the pork to the pot, a third at a time, and cook, stirring, until the cubes are evenly browned on all sides, 2 to 3 minutes per side. As they are browned, transfer the pork cubes to a bowl and set aside. Add the onions and garlic to the pot and cook, stirring occasionally, until the onions are translucent, about 5 minutes. 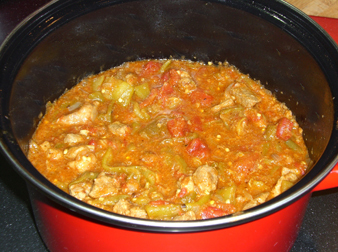 Return the pork to the pot, stir in the tomatoes, their liquid, and 3 cups water, and bring to a boil. Then lower the heat, cover the pot, and simmer for 30 minutes. Uncover the pot, add the chiles and oregano, and cook for another 30 minutes. Taste, and adjust the seasoning as needed. Notes: If you can’t find fresh chiles, use 2 cans (16 ounces each) whole green chiles. Drain them seed them, and cut them crosswise into 1-inch slices.